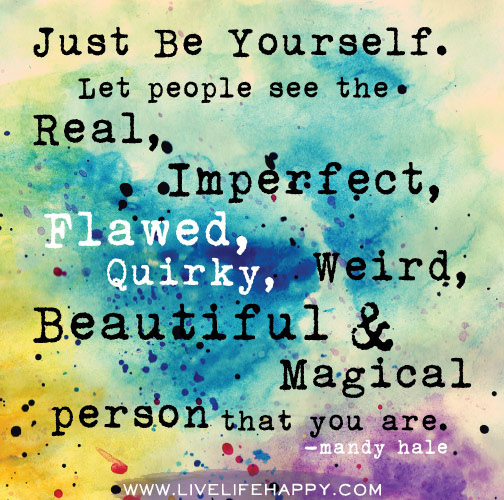 Today, I have a task for you: BE YOU. I want you to be whoever you are. I want you to be the true you that you’ve been too scared to show off to the world. That weird, happy, excitable, thoughtful, excellent and amazing person you are? Let them out! If you’re not sure who the true you is right now (I’m still not sure myself, but each day I let bit more of myself shine), then pick one aspect of yourself you’ve been fearful of showing off to the world, and SHOW IT OFF TO THE WORLD! Remember, this is YOUR world, YOUR life, and YOU make the rules as to who you are and how you live. Bit by bit you’ll tune into the real you and you’ll find the answers you’ve been seeking. But, more importantly, you’ll find yourself. Watch not only how your day brightens, but how your life changes. As you become more in touch with the real you and not the façade you’ve lived for the benefit of others (we’re all guilty of it), the universe recognises this and becomes accommodating to your true purpose, your soul purpose, and to your dreams. To shed more light on this issue we all face I’m going to be quoting from Osho’s book Living Dangerously. I hope what I write brings guidance and clarity, and inspires you to let yourself out of the cave (if you’d like to know more about this cave then I highly suggest reading Allegory Of The Cave in Plato’s The Republic). Osho – born Chandra Mohan Jain – was a spiritual teacher and philosopher, and was viewed as somewhat ‘outspoken’. Personally I don’t find his ideas controversial – some may be hard to grasp admittedly, but that’s because we’ve been conditioned to think inside the box since birth. His words are very thought provoking and empowering. And, I’m guilty of admiring people who think differently and act according to their nature and who they are. As I’ve mentioned in previous posts I’ve consciously decided to start my journey to enlightenment in this lifetime (although I have a feeling I started in a previous lifetime and I’m merely carrying on). Being truly individual and comfortable with myself is one of my aims. Since I was young I’ve always disliked being the same as everyone else – not because I disliked them, but because I felt they didn’t understand certain aspects of life; I didn’t want to get caught up in their beliefs and ideas and lose myself. I have since learned that everyone is on a journey and gains understanding at their own pace, and that it’s not that they don’t understand life, they’re just following what they feel comfortable with. I didn’t want to think or be the same as everyone, and I generally found the societal sheep-breed of ‘individuals’ to be laughable and false. And yet, how could I become a true individual when society eventually conditioned me to be fearful of the consequences of living outside of the economic dream? I was considered the ‘weird’ kid at school – a label I found immense joy in. What I didn’t realise was that by allowing myself to labelled as weird, I negated any individuality I thought I possessed. I ended up finding school incredibly boring because I wasn’t allowed to read and write what I wanted. Education became another form of controlled creativity. I knew what to write to get the necessary grades, but I didn’t want to. It felt fake. I got called lazy because I decided that if I couldn’t express my opinion, then I wasn’t going to express any opinion. I never liked the fact that the education system expected me to reel off their biased, distorted beliefs. So, naturally, I became academically lazy. I do have an English degree, but when I got to university I found myself disappointed that again, I couldn’t write what I wanted. Sure, I got to pick my dissertation topic which was amazing, but I was basically told that I wasn’t entitled to write my opinion, and anything I did write had to be referenced to someone else’s opinions. I ended up finding myself voiceless because I had let authority condition me into thinking that it was worthless. Hence, the struggle for true individuality. This is just one example of how someone can become voiceless and of course there are many other examples. But now, there are many of us out there who are consciously taking control and choosing to finally speak up. How can we be individual in a world that has labelled what constitutes individuality? How can we be truly individual when society has made true individualism something to be feared? Look at Socrates. The Greeks voted to have him poisoned. They considered him a danger to society because he was teaching people how to think and what life is really about. Socrates was saying “that you cannot walk on a way made by others for you. You have to walk, and make your road by walking.” (Osho, Living Dangerously). In other words, create your own path by walking with yourself and for yourself. The Greeks saw that Socrates would’ve further upset their already unstable and fragmented foundation of society if they didn’t take immediate action. It is written that because Socrates was truly individual he accepted his fate with grace, knowing that death is an experience and one he was ready for. If there’s one lesson we can take from Socrates, it’s that we should ALWAYS speak our truth because it’s a reflection of who we truly are. At the moment we are living in a society full of hypocrites. We’re all trying to be like someone else, meanwhile forgetting that we aren’t someone else; we are us. I am me, and you are you. No-one else. We’re all imitating each other, and as Osho suggests: “Never imitate”. I understand we’re all trying to find our way and sometimes that means imitating our idols or powerful authority figures – but they aren’t you. They don’t feel the same emotions as you, and they don’t think the same thoughts as you. We are fearful of being ourselves because being ourselves in the current world we live in means being ostracised and penalised by people whose own fear and arrogance holds them back from being accepting. We should never imitate because it’s not being true to ourselves (I’m sick of me constantly saying this too but it’s important! Haha). Being truly individual is like injecting poison into the heart of society. Society has created – or given the impression of – just enough freedom for us to believe we’re individual. Being individual is not dangerous: we’re merely returning back to our true nature. Society views it as dangerous because it’s scared of the collapse of the status quo. There is no status quo – just our conditioned perception of it. It will be hard to begin with because we first have to come out of our caves and open our eyes to true reality. We also have to ignore what others say and trust in our intuition. But we CAN do it! All you have to do to be truly individual is aim to BE YOU – whoever you are. There is no need to be anything else. Live life as you, and live it truthfully and absolutely. Isn’t It Time We Stopped Worrying About Time?